This headphone set fits your head perfectly. The headphones are quite cheap when compared to other contemporary models. These headphones provide awesome bass sound. The mid and treble ranges of this headphone set is not as good as it could have been. The headband can be a bit too tight for the preferences of some users. This headphone set is a great device to use in a situation when you want a headphone that can be acquired for a low price. 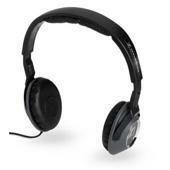 It is also designed to provide great sound quality while providing the utmost comfort for users. These headphones are designed more towards providing the average listener with a good listening experience. The Sennheiser HD 218 is yet another innovative headphone to be unveiled by reputed manufacturer Sennheiser. These headphones are designed as budget equipment that can be purchased at quite a reasonable price. The Sennheiser HD 218 is sleekly designed with a completely black look. The headband and ear cups are padded for extra comfort and prolonged wearing. This means that you can listen to your music on the Senneheiser HD 219 for hours on end without feeling the need to take them off. Some users have complained that the headband is a bit too tight for their liking, however. Since the ear cups of the Sennheiser HD 218 incorporate an on-the-ear style of design, they completely cover the ears of the user, thereby introducing an element of noise-cancellation. This is a handy feature of the Sennheiser HD 218 because you can achieve a level of noise-cancellation without having to use batteries or specifically-designed power switches. The greatest thing about the Sennheiser HD 218 is the level of sound quality that it provides. Thanks to neodymium magnets included within the headphone speakers, the bass thump delivered by the Sennheiser HD 218 is exceptional. However, the mid ranges and treble are a bit on the weak side, which is one of the minor shortcomings of this remarkable headphone set. Despite its minor flaws, the Sennheiser HD 218 is the perfect choice for those buyers who want a high quality product at the lowest possible price.